You are here: Home > My Hopeful Life Blog > A guide to Metastatic Cancer… ? A guide to Metastatic Cancer… ? Since my cancer diagnosis in 2007 I have continually sought opportunities to share my story. In doing so it helped me process my feelings and experiences. I started Hope Scarves as a way to help others do the same. 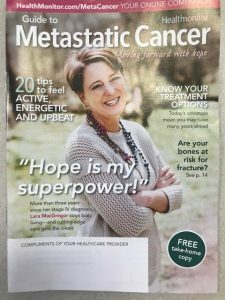 When the cancer spread to my bones and became metastatic breast cancer (MBC) in 2014 the first thing I did was seek connection to people who shared this experience. Our common story was empowering. I was not alone in my fear, anxiety, devastation. Or in my hope, joy and celebration. As I made my way through 4 years of life with MBC I realized how very different our stories are as MBC patients. While my treatments are able to keep cancer from growing in my body (for now) many are not this fortunate. 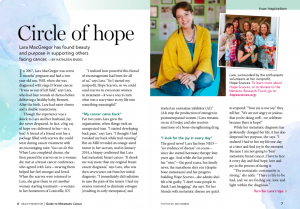 Balancing my hope and joyful life with the reality of this disease is difficult. 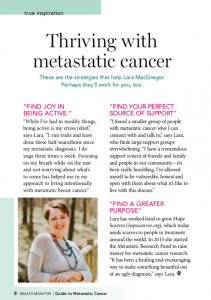 So, when asked to be featured in the national Metastatic Cancer magazine I struggled with the opportunity. Of course, I was honored to share my story so that my experience might bring another person hope. I was eager to spread the word about Hope Scarves and our work to share scarves, stories and hope with people facing cancer. I wanted to fill the pages about the need for funding in the area of MBC research and our work to raise money for research. Most of all I didn’t want to sugar coat the experience or add to the endless stream of happy, laughing cancer images. MBC is ugly. It rips families apart, kills young vibrant women, steals motherly kisses from children and is most likely going to kill me. How do we tell the whole story? How do we show the joy of living life over cancer while not forsaking the despair of the disease and the imminent need to increase funding for MBC research? I’m not sure… When the magazine arrived at our office I was both excited and frustrated. My article doesn’t include a lot of the “ugly” I talked about in my interview. Does my smiling face on the cover hurt my desperate plea to increase funding for people dying of MBC? Especially knowing two of my friends whose beautiful smiles once graced the cover have since died of MBC. “It needs to be more raw…” I think to myself. Or, perhaps not. Maybe this article will be read by a young woman who is drowning in her fear and needs to know she might have 4 incredibly healthy years ahead of her as I did… maybe my story could bring her light. This balance of hope and desperation is arduous. This week my friend Dianne was killed by MBC. She leaves behind two young sons and a heartbroken husband. Since I met her in 2013 she has endured full brain radiation, gamma knife surgeries, toxic chemotherapies with side effects of fatigue, constant vomiting, debilitating pain and more. She never experienced a long stretch of wellness. At the end she was incoherent, incontinent and ravaged by the disease. This is MBC. Her death adds to the list of more friends than I can count who died since I became aware of the devastating world of MBC in 2014. Today the pain outweighs the joy. My anxiety is in full effect. I have a twinge in my side that has been nagging me for a couple weeks… is it MBC? Is my number finally up? Is it my time to join my friends in the endless, toxic treatment carousel of MBC that eventually ends in death? As these feeling weigh on my heart I am traveling to Florida for a girls weekend. We will laugh, talk about our kids and just celebrate life. I am grateful for this time of healthy and stability… to lead a “normal” healthy life. Gratitude overflowing. But, see what I mean… My see-saw life. A day doesn’t go by that I don’t worry about my health and the future. And, quite frankly, a day doesn’t go by that I don’t laugh spontaneously, worry about normal life things like carpool and scheduling my dog’s (very overdue) grooming appointment. Life is tricky. Complicated. For all of us… I know there are others who balance wide swinging emotions too – Grief, addiction, depression. I’ve learned to allow my emotions to swing – to not get frustrated when I’m anxious, but to let the feelings come. To acknowledge and accept them. This is my story. A story I never imagined owning. But, since I do, one I am trying to use to support others. Whether in finding connection through Hope Scarves, raising money for MBC research or trying to tell the whole story of cancer. And, always, always grounding myself in hope. I am proud to be a founding partner in the MBC Research Collective with Twisted Pink and The Cancer Couch. Together in 2017 we raised $600,000 that was matched 1:1 by an anonymous donor for a total donation of $1.2 million for MBC research. Our goal for 2018 is even bigger. Learn more about our MBC research efforts. Lara, for so many reasons I am touched by this article and once again, inspired by you. In this article, you educated all of us on the truth behind this terrible disease. Your smile does not hide your truths… Thank you for your raw honesty and shining a bright light on MBC. Thank you for your kind words. I love the comment you made that my smile doesn’t hide the truth. Your constant love and support mean the world to me Aunt Joanne. Thank you! Look forward to seeing you this summer in Michigan. Looking forward to seeing you @ the shower & wedding. I’m sure you bring hope and a better sense of understanding this roller coaster of MBC. Thanks Aunt Carol! Can’t wait to give you a big hug this summer. Much to be grateful for. You again touched me as if you were standing right in front of me. I helped you with the tracking labels for the scarves when Hope Scarves was just starting. The real of your life touched me than and especially now. I sit here in tears as a year ago on my 60th birthday I was diagnosed with MBC. Today before I read your words I had decided that I was going to give up treatment because in my mind how much worse could daily life be than the side affects of the chemo, radiation and estrogen blockers. Until now I said I am surviving to SPITE cancer but now I am tired. The smile on my face that everyone loves does not show the struggle! I love you in ways that words cannot describe. You have my heart and my prayers because I know the body struggles. Lara, you inspire all of us every day. And the response from Victoria proves that being real is touching so many lives. Thank you for your honesty in both the good and the bad. Love you! thanks Becky – I am so touched by Victoria’s comments. And how life’s connections unfold. There are no words to describe how incredible these beautiful posts are or how much emotion they can bring…..your inspirational words and blatant honesty are amazing. Love you…. Lara, You are so honest and sincere, and it is felt deeply by many. You live your life with such strength and grace. It is truly amazing!! Are you monitoring what kind of research exactly you are funding for metastatic breast cancer? Both my brother and sister died from the allopathic medicine’s “standard of care” treatments for metastatic cancer. And as a their surviving sibling -also with MBC – I really wish to see research money being spent on nontoxic and natural substances like cannabis, for example, as well as other herbs, like wormwood, mistletoe and artemesia, and others. See Manuel Guzman full professor at Completense University in Madrid has studied cannabis in cancer since 1999. https://youtu.be/57h_sah2tas Also, healingstrong.org is a very helpful website for those who need a hopeful voice.